Given that Dr Samuel Johnson only spent eleven of his many years in London at his most famous address - 17 Gough Square - and otherwise lived at around 17 different places in London, many of which were in the vicinity of Fleet Street, it seems fitting that a statue outside St Clement Dane's commemorates him, erected by the Rev'd S. Pennington, Rector of the church in 1910. Your author owes more than most to Johnson, the great eighteenth century writer and lexicographer who put together one of the first widely recognised English language dictionaries. 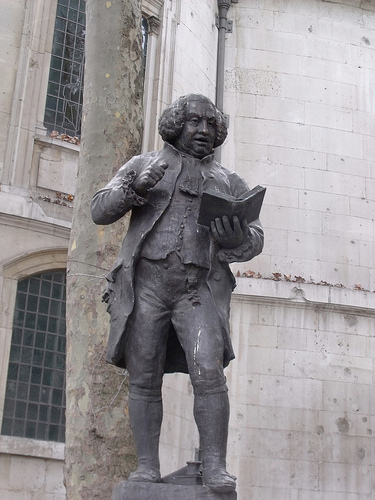 It was Johnson whose love of London inspired this website, and the book that followed it, and many happy hours have been whiled away volunteering at Johnson's house in Gough Square off Fleet Street, and seeing this statue of Johnson reading aloud up on his plinth to the rear of the church always brings causes, for he was a great man. Well I never knew there was a statue to the great man in London. When we recently visited Dr Johnson's House there was no mention of it. After finding out so much more about the man at his museum I now have a new found respect for the man. he certainly was a real character.